Born from volcanic activity approximately 30 million years ago, Paul Bunyans Woodpile is a unique geologic feature in Juab County, central Utah. Looking like a series of colossal woodpiles stacked up neatly by a giant (in this case Paul Bunyan), this site is a relic of Utah’s volcanic past. A volcano, similar to the large composite or stratovolcanos of the modern Cascade Range in the Pacific Northwest, was active in the vicinity of Paul Bunyans Woodpile. This volcano became inactive and later collapsed, forming a caldera or a large hole approximately 8.5 miles in diameter and more than 3,000 feet deep. After a brief period of dormancy, the volcano became active within the caldera for a brief period of time. 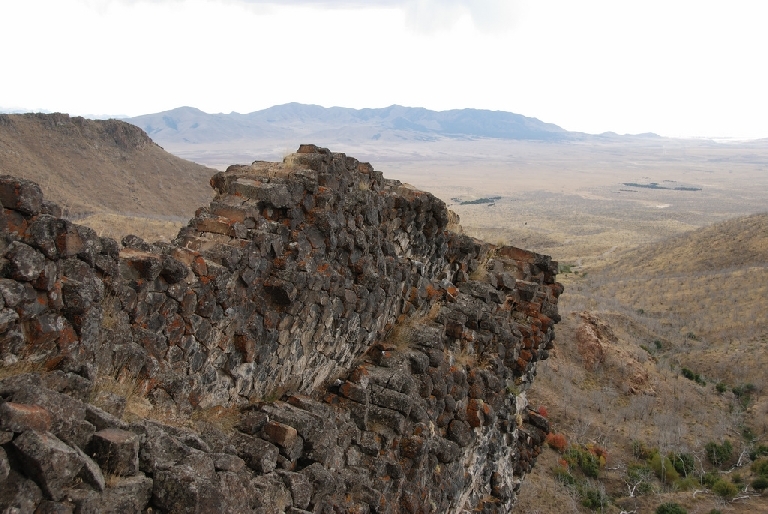 Recent work conducted by Brigham Young University indicates that the Woodpile may be a series of numerous dikes, probably the result of this later volcanic activity. Dikes are composed of an igneous rock and are oriented vertically. They form when magma is injected into preexisting cracks or fissures and later cools under the ground surface. The Woodpile is a classic example of columnar jointing where the rock fractures in prismatic patterns, producing parallel columns. These columns form when cooling magma within the dike contracts, forming cracks similar to those on the surface of a cooling cake. Once a crack forms, it continues to grow from subsurface cooling, thereby forming longer and longer columns. Each column at Paul Bunyans Woodpile is approximately 1 foot in diameter and up to 15 feet in length. The columns are three to seven sided depending on slight variations in how the lava cooled. These columns are oriented horizontally and give the appearance of having been tilted on their sides. 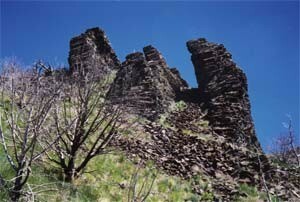 Normally, columnar jointing is associated with lava flows, and the joints are oriented vertically. However, the horizontal orientation here appears to be the result of subsurface cooling from the sides inward to the middle of the dikes. The Woodpile is also home to an arch. This arch was created by a process known as frost action, which involves expansion and contraction associated with repeated cycles of freezing and thawing. In this process, water enters cracks in the rock and freezes; the expanding ice creates separation along the cracks. Eventually the rock will break off, creating holes in a rock outcrop. The estimated span of the arch is 20 feet long by 4 feet high. This arch can be seen by hiking farther up the trail and viewing the Woodpile from the side. From Salt Lake City, travel south on I-15 to Santaquin (exit 248). Turn right (west) at the end of the off ramp onto U.S. Route 6. Travel west and then south on U.S. Route 6 for 35.7 miles to a sign indicating Paul Bunyans Woodpile turnoff. Turn left (east) and proceed up the road for 3.2 miles to the trail head to the Woodpile. This stretch of road can be quite rough so proceed with caution. Do not attempt when the road is wet. Once at the trail head, proceed through the gate and hike approximately 0.5 miles to the Woodpile. Make sure you close the gate after you. The trail is well marked and a relatively easy hike. Bring plenty of water and sunscreen. Lynndyl 1:100,000-scale topographic map, Tintic Mountain 1:24,000-scale topographic map, and a Utah highway map. Topographic maps can be obtained from the Natural Resources Map & Bookstore, 1594 West North Temple, Salt Lake City, UT, (801) 537-3320.